Most museum exhibits are about things that are, were, might be down the road, or are just imagined. But I just toured a yeasty one about things that very well could have been but never were. It’s Unbuilt Washington, a new exhibit at the National Building Museum that will run through May 28th next year. Possibly you’ve passed by our capital city’s iconic buildings and memorials. Or almost surely seen fetching photos of the White House; the U.S. Capitol; the Washington Monument obelisk; memorials to notable presidents; and the grand museums that line the vast National Mall. They are idealized, and realized, visions that have come to symbolize American democracy. 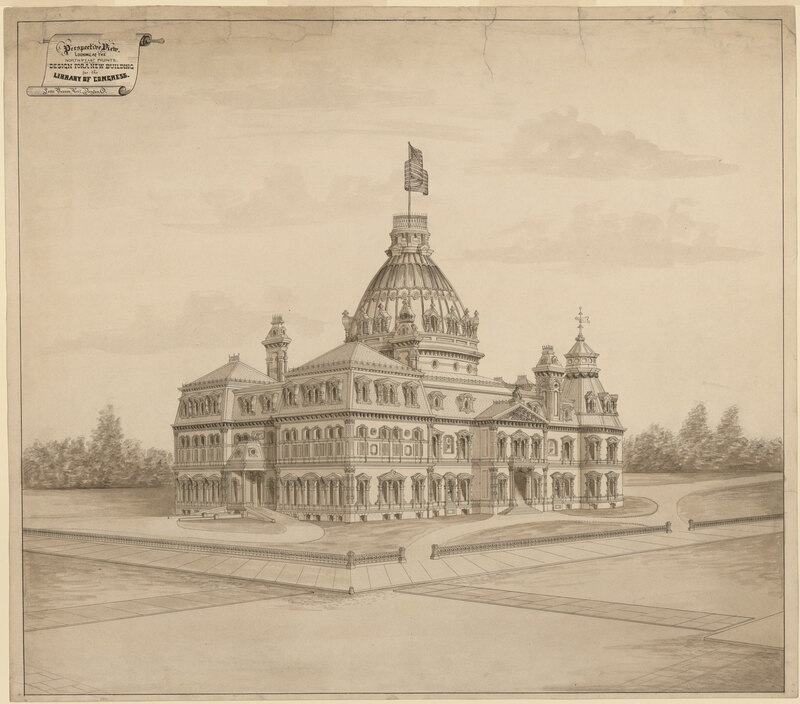 But Unbuilt Washington points out that vastly different structures — some even grander, others kind of kooky — were in the running for these and other treasured places. And, in three or four rooms, it displays the sketches and plans and models to prove it. 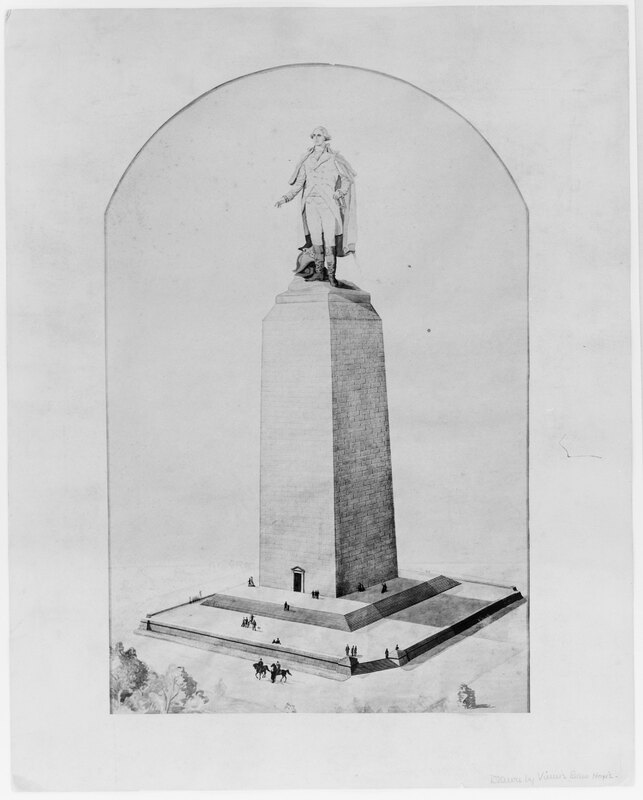 A huge statue of George Washington, for instance, right atop the partially completed Washington Monument, which had sat as an ugly stub on the National Mall for more than 20 years in the 19th century. And a walking bridge across an inlet of the Potomac River, complete with shops and outdoor cafes, looking a lot like Florence’s Ponte Vecchio — or a gaudy Atlantic City ocean pier, depending upon your point of view. And a “National Sofa” just outside the White House! Yes, a National Sofa! I’ll tell you about it in a bit. Would Parisians feel as passionate about a modernist spiral as they do about the Eiffel Tower? And would a tiered pyramid be as evocative to Americans as the Abraham Lincoln figure that gazes between majestic pillars down the Mall? 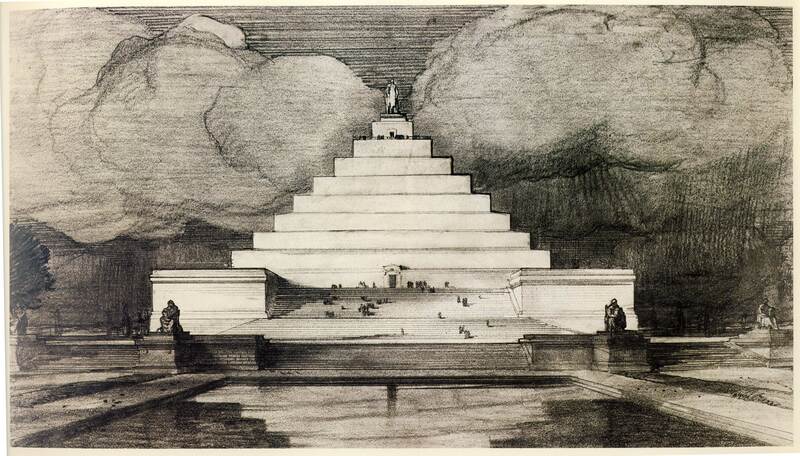 It’s hard for me to imagine that it would, since a standing figure of Lincoln was planned as what one Web site called the “cake topper” at the pinnacle of the proposed stepped pyramid. Would we have gotten used to a span of London Bridge proportions, complete with Tower of London-sized turrets and castles, where the low, dignified Memorial Bridge crosses over to Arlington National Cemetery? It certainly would have been way out of scale with what’s around it. 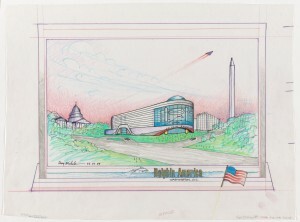 The building museum’s senior vice president, Martin Moeller, Jr., himself a noted architect who took great delight in curating the Unbuilt Washington exhibit, told me that there are a dozen good reasons why some of these schemes for updating the capital never got built. Some were beaten out by other plans in design competitions, or quashed by the many arts commissions that pass judgment on public-building design around here. Sometimes money ran short before construction could start. Wars and depressions thwarted others. Local outrage smote projects such as the proposed Capitol Hill Expressway that would have thrust two elevated freeways right through the monumental core of the city. And some plans were viewed as simply too frilly, not frilly enough, or even “too French.” “Yeah, there was heavy French envy for awhile,” Moeller confirmed. 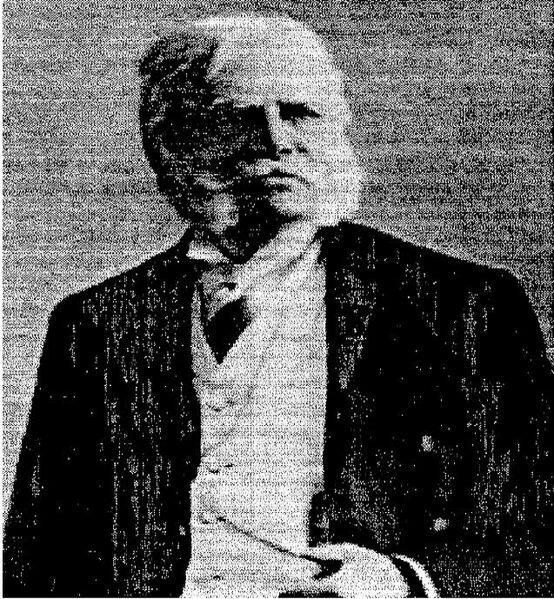 Sometimes the families or descendants of the intended memorial honorees objected, even to plans that had been approved. Take the original design for the Franklin Delano Roosevelt Memorial along the Tidal Basin of the Potomac River, okayed in 1964. It visualized a series of tall, closely bunched slabs, rising as high as 57 meters into the air. The Roosevelt family and others squelched this idea as too competitive with the nearby Washington Monument and not in keeping with Roosevelt’s desire for a modest memorial, “no bigger than this desk [to which he pointed]” if one was to be built at all. Indeed, Roosevelt’s only memorial for half a century was a small marker outside the National Archives on Pennsylvania Avenue. 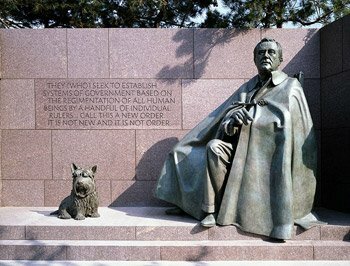 What was eventually built was a series of outdoor “rooms” full of statues of FDR, First Lady Eleanor Roosevelt, Depression-era workers in a breadline, and even Roosevelt’s dog, Fala; plus lots of Roosevelt quotes and a quiet, cascading waterfall. 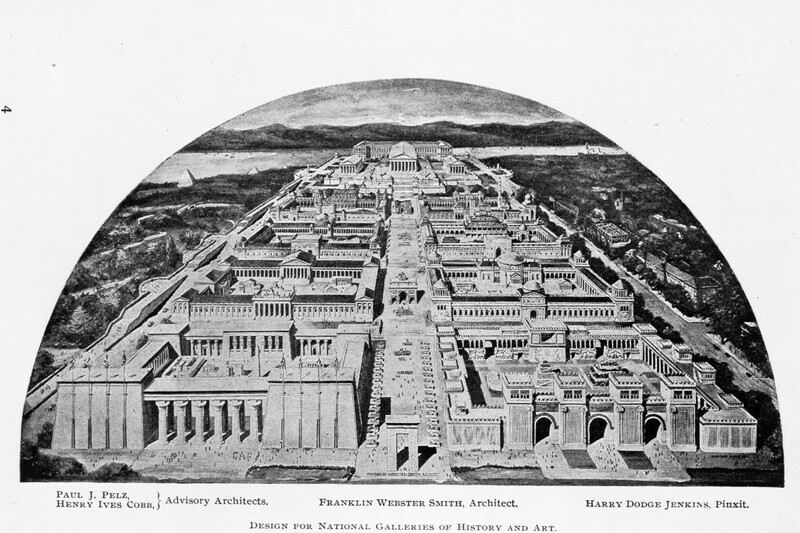 • In anticipation of the city’s bicentennial in 2000, the Museum of Modern Art in New York commissioned Luxembourg-based urban planner Léon Krier to devise a master plan for a new and better Washington. This was obviously hypothetical, and it’s a good thing, I can say from my writing perch right across from the Washington Mall: Krier’s plan, if miraculously executed, would not only have FLOODED much of the Mall, turning it into some sort of futuristic Venetian canal, it also would have leveled many outsized federal buildings (such as our 1942-vintage rockpile of a bureaucratic fortress) in favor of pleasant mixed-use neighborhoods. • In the first few years of the 20th Century, Washington got an amazing facelift, thanks to something called the McMillan Commission, details of which would bore you. 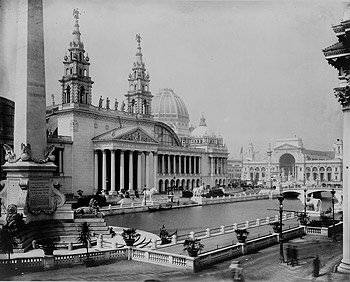 It involved master architect Daniel Burnham, the impresario of the amazing World’s Columbian Exposition, almost a decade earlier in Chicago. That “Great White City” of temporary fair buildings inspired an entire “City Beautiful” movement across the country, including the nation’s capital. And a few years later, a notorious precinct of taverns and gambling halls called “Murder Bay,” as well as adjacent neighborhoods along Pennsylvania Avenue, were replaced by the Federal Triangle complex of neoclassical government buildings. But that’s not the story. This burnishing of the grandeur of Washington may also have been influenced by what most people now view as a crackpot idea a year or two earlier. 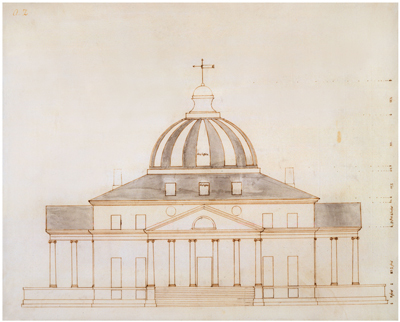 In 1900, Franklin W. Smith, a Boston hardware merchant with interest but no expertise in architecture — and no previous connection to the national capital — dreamed up the idea for what he called the “aggrandizement of Washington.” He meant this as a positive. Concerned that the United States lagged behind other “civilized” nations in cultural development, he proposed a huge complex of art and history museums spanning 25 hectares in “Foggy Bottom,” very near the present location of George Washington University. Smith even opened a storefront on K Street in which he proudly showed passersby a model of this cultural enclave. Amazingly, the plan made it as far as the U.S. Senate, which instructed the Government Printing Office to produce an entire book about it. But nothing came of Smith’s dream. 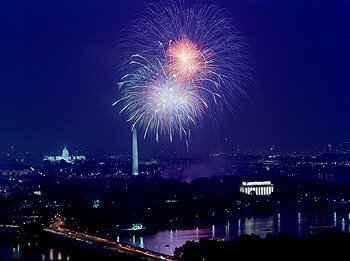 • Around the same time, Mary Foote Henderson, the wife of the former U.S. senator who had written the constitutional amendment that banned slavery, was building quite a little real-estate empire on 16th Street, just above the original core of designer Pierre L’Enfant’s Plan of Washington. Many mansions, including the city’s first “embassy row,” were built along this corridor. But Henderson had even bigger ideas. She pushed for a palatial executive mansion — a White House on steroids — high on a promontory in what later became Meridian Hill Park. It was probably no coincidence that the Hendersons lived right across 16th Street from this location. Admittedly, the president’s house had grown a bit cramped at a time when the nation was flexing its muscles throughout the world and the executive branch was growing. 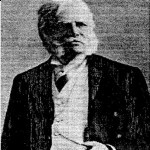 But Congress, in no mood to elevate the president’s importance, paid Henderson’s lofty presidential palace idea no mind. • In 1922, Daisy Calhoun, the wife of a prominent Washington lawyer, founded The Woman’s Universal Alliance expressly for the purpose of building a memorial to mothers that would “proclaim the debt each mortal owes to the woman who risked her own life to give life.” Several designs were advanced, including one by Joseph Geddes that Martin Moeller calls “sturdy and stern,” for a site near the Naval Observatory. But Daisy Calhoun was unable to raise the funds to build this Monument to Moms. • And then there’s the National Sofa! This was the idea advanced by architects Doug Michels and Jim Allegro when a block of Pennsylvania Avenue in front of the White House was ordered closed to vehicular traffic during a domestic-terrorism scare that followed the 1995 bombing of a federal building in Oklahoma. 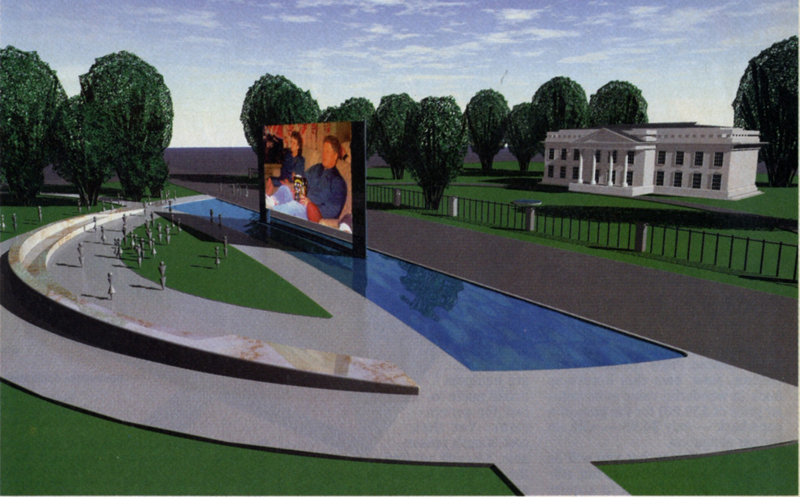 The architects proposed an “interactive monument” in which citizens could lounge on a long, marble sofa and have occasional, real-time conversations with the First Family across the White House fence via a giant video screen. It wasn’t as obtrusive as it sounds. The screen would have risen from the earth and then retract when not in use. • Architect Michels’ idea, in the late 1980s, for a “Dolphin America” hotel. Michels was fascinated with these ocean mammals. He believed that humans underestimated their intelligence, and he even conceived of a joint human/dolphin colony in outer space. 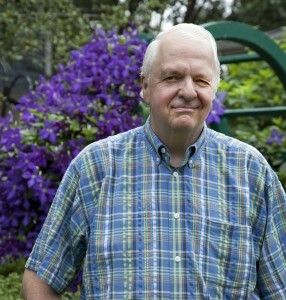 He spotted a site on Massachusetts Avenue, roughly between the U.S. Capitol and the White House, for what he envisioned as a complex that would include a hotel, museum, health club, and research lab. But for one reason or another, Michels never pursued funding, and Dolphin America never came up for air. 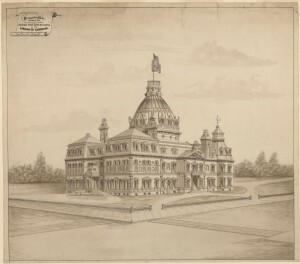 • Early plans for a standalone Library of Congress, which had outgrown its home inside the U.S. Capitol after passage of the Copyright Act of 1870. That law required the library to accept two copies of each book submitted for copyright protection. 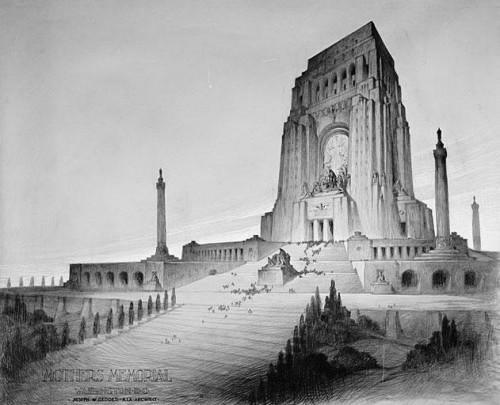 One of the proposals envisioned an ornate cathedral-like structure so gargantuan that was eventually rejected, in part, because it would have overshadowed the Capitol itself, next door. What was eventually approved and then completed in 1897 — an Italian Renaissance charmer of a building with a distinctive copper dome — is one of my favorite landmarks in Washington. • And legendary modern architect Frank Lloyd Wright’s designs for “Crystal Heights,” a shimmering, glass-shrouded apartment complex on Connecticut Avenue. Never materialized. 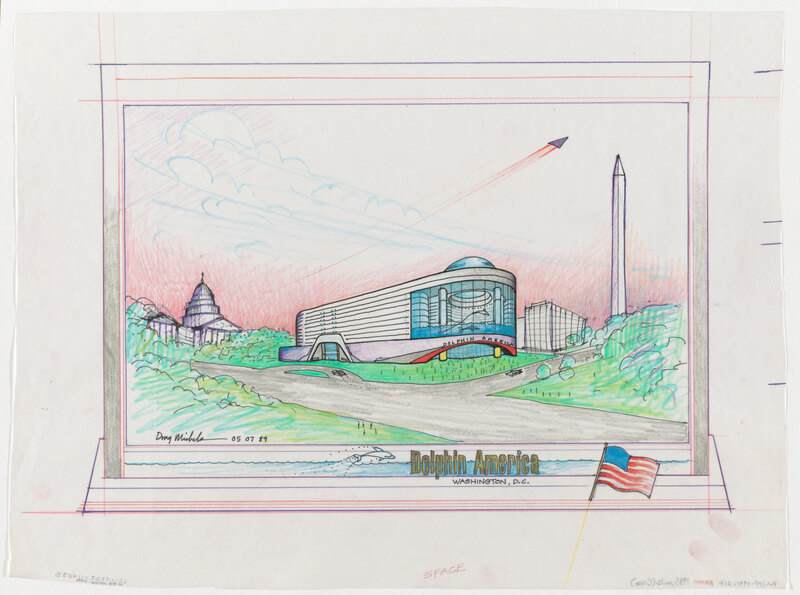 The last piece of the Unbuilt Washington exhibit that visitors encounter is an illustration of a new idea for the National Building Museum itself. That museum, you should know, is housed in a glorious space: the old Pension Building. It was constructed between 1882 and 1887 to house the U.S. Pension Bureau, a Federal agency created to award pensions to Union veterans of the U.S. Civil War of the 1860s and any vets still living from earlier wars. The red-brick, Italian Renaissance Revival building takes up a full block in Washington’s Judiciary Square neighborhood. The roof of the four-story Great Hall is supported by colossal Corinthian columns that are among the tallest interior pillars in the world. That atrium is a favorite site for important parties, including presidential inaugural balls. 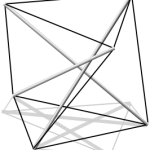 British architect James Eyre has come up with plans for a temporary installation — a “tensegrity bridge” — over the building’s vast open space. 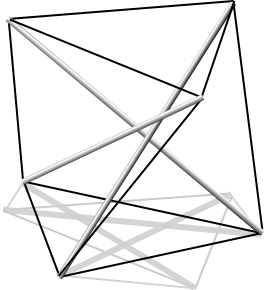 It’s an idea, borrowed from futurist inventor and designer Buckminster Fuller, for a glass bridge that would look fragile, unsupportable, even gossamer-like, across which people would walk as light pulsed according to their steps. This is one idea that the building museum hopes will NOT go unbuilt if the money can be found to create it. And I’ll close with one more drawing, by none other than Thomas Jefferson. It’s his plan for the president’s residence, and a rather humble one at that. He would eventually live in the president’s dwelling, but it was larger, finer, and whiter! Burnish. To polish or make something smooth and shiny. People even try to burnish their images. Gossamer. Extremely delicate. A butterfly has gossamer wings, and a spider spins gossamer webs. Tags: Architecture, National Building Museum, National Mall, W, Washington D.C.